2018 is finally drawing to a close, causing gamers around the world to reflect on what an amazing year we’ve had. While the industry’s heated Game of the Year arguments are mostly focused on the world’s best Western and world’s worst dad, there were a ton of other games that I loved just as much in 2018 (well, almost anyway – I really wanted to be a cowboy as a kid, okay?). I’ve already written about how much I enjoyed hunting giant monsters, web-slinging through New York City, getting unceremoniously shot in the back, and hanging from Zeus’ giant dong this year. 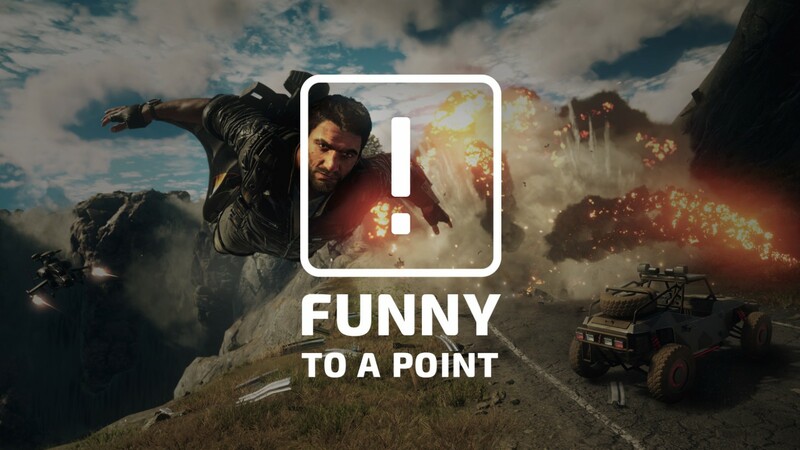 My latest obsession, however, has been a little game called Just Cause 4, which I was too busy reviewing to offer up the usual FTAP treatment when it released – I just hate when real work stands in the way of getting stupid! Anyhow, I’ve written about my love of blowing stuff up in video games before, and the Just Cause series has been a favored outlet for my destructive tendencies ever since the first entry. Just Cause 4 is no exception – however, that apparently makes me an exception, given the number of irate Just Cause “fans” complaining about JC4 on the internet. Their shared insistence that “the PS2 totally had better graphics!! !” makes me think there’s some kind of coordinated troll-bot shenanigans going on, as does their mutual talking point about how “the water is hideous!” Have we learned nothing from PuddleGate?! While I could write an exhaustive and inconvertible defense for *checks notes* why I enjoyed playing a video game…I thought I’d instead share my adoration of Just Cause 4 in video form instead. That’s right – even though I couldn’t write a column about my stupid antics in Just Cause 4 while I was reviewing it, that didn’t stop me from recording dozens of videos of said stupid antics. YOU’RE WELCOME. One of the biggest draws of the Just Cause 4 series is goofing around with the physics and Rico’s infinite supply of tethers. In this instance, I was trying to tether a series of barrels together into a platform, which I planned to attach a balloon to and ride into the stratosphere. Alas, things never go as planned. One timeless Just Cause shenanigan? Putting a rocket booster (or 10) on the back of a car. Even a banged-up Beetle can become a blistering speed demon – or an improvised missile, as the case may be. My Beetle exploits led to an obvious question – what other vehicles can I send rocketing out of control? There’s no way “TRACTOR!” wasn’t the answer. …Also, the honking is what really sells this clip, if I do say so myself. Turning cars into giant and deadly ground bloomers is fun and all, but I really wanted to see if I could max out a car with rocket boosters and have it still remain drivable. The results depend entirely on your definition of “drivable” – there was definitely a second or two in there where I was on a road. Still not satisfied, I decided to take a more scientific approach to my experiment, by…well, grabbing the fastest car I could find and slapping a bunch more rockets on it. This time the success depends on what your definition of “flyable” is. Look, I knew there was no way in hell a semitruck would perform better than the previous sports cars – I can’t even keep it on the road BEFORE the boosters. But can you really argue with the results? 7. Who Needs The Fortnite Bus? My experiment with the semitruck got me thinking – perhaps a bus would fare better? It didn’t. However, a bus with some added balloons for stabilization ended up being way more entertaining than I anticipated. At some point, I had to face the facts: Maybe the problem wasn’t the rocket boosters at all – maybe it’s my driving. So I removed myself from the equation and assigned a poor hapless civilian to the driving instead. She really performed her duty flawlessly – right up until the flying off and exploding in the distance, at least. Another random experiment I spent way too much time on? Seeing if I could get a car to do a full loop over an overpass after connecting it with tethers and rocket boosters. DO YOU SEE WHY I LOVE THIS GAME NOW?! I’ll be honest – I really feel bad about the cow. Not so bad that I wouldn’t totally do it again in a heartbeat, but really kinda bad. Interestingly enough, I don't seem to feel bad about this one at all. What does that say about me? Nothing good, I suppose, but that's what you get for wearing highheels on the beach! I'm sorry, but what was I supposed to do in this situation? Just look at the guy sitting on the hood of his car and NOT attach a bunch of rockets to the back? Ultimately, the surprise was on me, but I have to give him props for handling the loss of his car so well. 14. How Do Planes Work Again? Look, some of Just Cause 4’s rocket booster options are a bit confusing, like the mod that changes the directional thrust of a booster when it’s applied. On the plus side, we now know what would happen if you accidentally threw your plane into reverse while you were flying it. That’s realistic, right? In my defense, I’m apparently not the only one who doesn’t get how airplanes work, as evidenced by this pilot I ran across during a story mission. I really hope I never go through a takeoff like this in real life. Fun fact: Just Cause 4 has a little seaside amusement park, which I can only assume the developers included for Rico to terrorize. First up, the merry-go-round, which I turned into a…merry-go-rounder? I dunno. I’m just tickled by the plumes of fire shooting out of the horses’ asses. Attempt number two went much better. Am I the only one who would be totally fine if the Just Cause 4 DLC was all exclusively carnival-themed? It wouldn’t be an amusement park without one of those stupid pirate ships that’s really just a glorified swing for people who are too afraid to go on real rollercoasters! Not the Just Cause 4 pirate ship, though – this sucker is for daredevils only! Look, I know I make being a professional gamer look super easy, but even I make mistakes every now and then. Luckily, even those are SUPER ENTERTAINING. As we all know, you can’t truly claim that you’re up to shenanigans unless there are giant balls involved (once again, see my Assassin's Creed Odyssey photo tour for verification). Thankfully, Just Cause 4’s giant balls are also highly explosive. I’ll be honest: The title of this video is “Not My Best Landing,” but this CLEARLY IS MY BEST LANDING. And finally, nothing sums up all the majesty and mania of Just Cause 4 quite like this video.